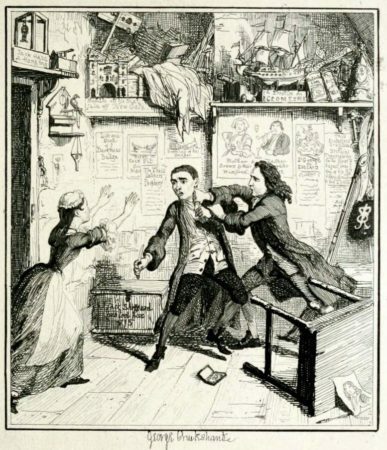 It’s a disreputable name, is Jack, a scallywag nomenclature from Ripper to Spring-Heeled, but Jack Sheppard (b.1702) is the best one. He’s buried in St Martin-in-the-Fields now, a lad who never stood a chance, but went down in London history. Raised in a workhouse and promisingly apprenticed to a carpenter, he switched to robbery and was very good at it. In 1724 he escaped from Newgate jail four times, usually while pissed, and used his slender build to slip through bars, although he once dressed as a fairly convincing woman. He also managed to get out of leg irons which were rivetted to the floor, and even showed his jailers how to do it. He’s the original working class hero, escaping on knotted bedsheets and through sawn-out bars, on the run in ankle-cuffs, staying one step ahead of the law and laughing about it. We remember him because his tragic story has the makings of a grand myth. Jack was born in Spitalfields. Jack is usually a substitute for John – I had an uncle Jack/John – and so it was with Sheppard. He was short and slender, and stuttered, but was fast and witty, a pub-popular sprite. When he met the prostitute Elizabeth Lyon, or Edgeworth Bess, he was moved to rebellion and the politics of Levelling – at least, according to Daniel Defoe, who distributed his biography at Sheppard’s hanging. This may just have been an example of the usual practice of blaming a man’s fall from grace on a bad woman. The Sheppard misadventures largely took place around Clare Market, a neighbourhood now entirely wiped away at the back of Lincoln’s Inn Fields. In the early 1700s there were at least 107 pleasure-houses within it, and William Hogarth used to meet at the Bull’s Head Tavern there. Sheppard inspired many biographies, as well as ‘The Beggar’s Opera’ by John Gay, films like ‘Where’s Jack?’ (surprisingly good considering it starred Tommy Steele) and ‘Plunkett & Maclaine’, plus novels like ‘The Fatal Tree’ by Jake Arnott, written in thieves’ cant. 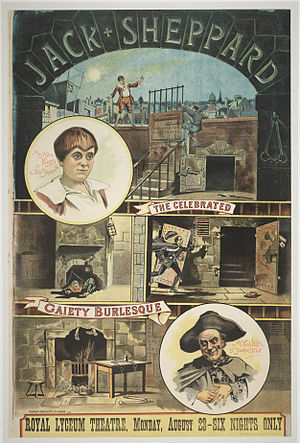 Sheppard could not fail to capture the public imagination because he was young and dumb and dead at 22, because his story is filled with thrilling escapes, because he had the love of a not-so-good woman and was pursued by a dastardly villain, the extortionist ‘Thief-Taker General’ Jonathan Wild. Wild was exploiting a strong public demand for action during a major London crime wave in the absence of any effective police force. As a gang-leader, he became a master manipulator of legal systems, collecting the rewards offered for valuables which he had stolen himself, bribing prison-guards to release his colleagues and blackmailing any who crossed him. He also met a sticky end, at the age of 42, a hanging which Defoe also covered. When Sheppard was due to be hanged at Tyburn, he was weighted down with 300 pounds’ worth of iron, a PR mistake that guaranteed his legend. Many signed a petition to have his sentence commuted to transportation, but of course he had Made A Monkey Of The Law, and had to go. On the way to his death he stopped in the Oxford Tavern, Oxford Street for a pint, to cheering crowds of well-wishers. A huge number of artists and writers were inspired by him, from Fielding to Hogarth from Brecht and Weill to Chicory Tip. Lately the great tale of Sheppard and Wild has fallen from public favour and I suspect new generations have never heard of the street urchin who thumbed his nose at the law. An uncountable number of decent men and women are long forgotten and never recorded unlike these two individuals. Jack is a criminal who appeals to emotions thanks to thumbing his nose at authority and execution at an early age. On the other side is the rich, corrupt agent of the state, a man of authority, respected and feared for his position. And I thought we’d agreed not to mention that subject? Anyone else think Mr Fowler should try his hand at a bit of historical fiction? Historical footnote… well, just because! The crowd may have been disappointed by having their folk hero hung, but the ‘weighting’ of the young was done as a kindness, to reduce their suffering. This practise would continue into the early 19thC, there is a documented account of such in an Australian Penal Colony from the 1830s. Our Jack suffered on the scaffold because he was so light. Many pubs claimed to be the Tyburn halfway house, including the Angel St Giles (still there) and the King Lud (now a Leons). It seems I siezed upon this line, “When Sheppard was due to be hanged at Tyburn, he was weighted down with 300 pounds’ worth of iron…”, and ran away with it, giggling [in the manner of Jack himself]. Let’s unravel that, if only to ease my confusion. The question why a notorious prison escapee might have been kept in very heavy chains, does rather answer itself. Why were they removed before the execution? Jack would have been well advised to keep them on, [it is not impossible that he was explicitly told so by people at the Gaol, who would have seen the results of many hangings.] But according to one source they were removed and Jack was bound with rope instead. If this was customary at the time or something insisted upon by the prisoner is unkown. If it had been done at his insistance then he contributed to his own slow and painful end. Jack had a plan, not a very good plan as it turned out, to escape en route to the execution by cutting his bonds, jumping out of the cart and slipping through the assembled crowd. 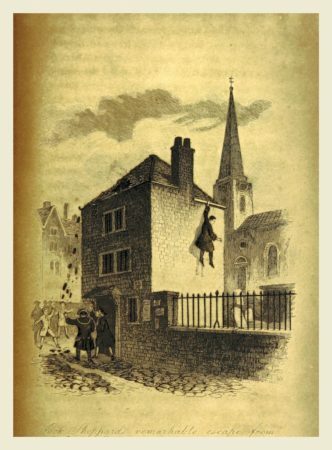 One account puts the scene of this escape to have been at High Holborn – to further frustrate any attempt at pursuit on foot or on horseback, Jack was to cut through a narrow alley called Little Turnstile. The plan fell apart before leaving the prison yard when according to one account: “…Watson, an officer, searching his pockets, found the knife, and was cut with it so as to occasion a great effusion of blood.” His fate sealed, the slow journey to the place of execution began among the usual riotous crowds of spectators that would attend these occasions in their thousands. He behaved with great decency at the place of execution, and confessed having committed two robberies for which he had been tried and acquitted. He suffered in the twenty-third year of his age. He died with difficulty, and was much pitied by the surrounding multitude. When he was cut down his body was delivered to his friends, who carried him to a public-house in Long Acre, whence he was removed in the evening and buried in the churchyard of St Martin’s-in-the-Fields.